- Childhood obesity and overweight are one of the greatest public health threats in the USA and Canada. Parents need to increase their awareness of the relationship of healthy food choices and physical activity for their child's body weight and the relationship of body weight to overall health. Parents need to increase self-efficacy regarding their child's ability to make healthy food and physical activity choices. Use the Food Pyramid to help you plan a well-balanced day of meals and snacks. Make meal and snack planning simpler. Arrange your cupboards and refrigerator by food groups. Give each of the groups (see list at right) their own area. Make snacks more nutritious by selecting foods from at least two different areas. Mix colors and textures for an appealing and tasty treat with variety. The more colorful the plate, the more nutrients! 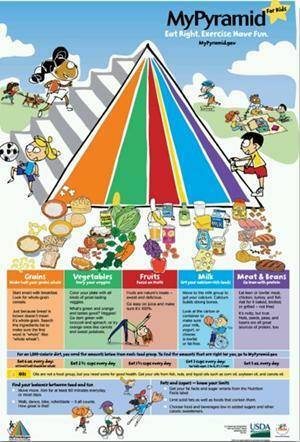 Make a snack spot where children can help themselves to healthy choices. Fast Food Choices and Fix Ups! • Order pizza with veggies (mushrooms, green pepper, fresh tomato, onion, broccoli) in place of pepperoni, sausage and other high fat meats. • Order sandwich with extra tomato and lettuce, on whole wheat bread with mustard in place of mayo. • Pick a non-creamy soup with chunks of vegetables or pasta and rice. Soups with beans are a treat and filling too. Try vegetable lentil, split pea or black bean. • Ask for tomato or marinara sauce on pasta dishes. Top it with a little parmesan ... a real child pleaser. On the Run? Be Prepared! - Don’t be stuck with high fat snacks when you’re out and about. It’s easy to bring nutritious snacks with you. These are “star picks” for fiber, vitamins and minerals and are also low in fat. • Keep meal times and snack times about the same each day. • Offer foods first, drinks/beverages last. • If child is thirsty in between meals and snacks, offer water. • If child plays with food without eating it, remove food after 10-15 minutes. • If food is thrown in anger, end the meal. • Keep table talk about the day’s activities and fun topics. • Don’t comment on food intake. • Don’t praise, reward or punish for food eaten or not eaten. • Instead of giving food as a reward, read, dance, play, and laugh with your child. • Don’t give food as a present. • It’s OK if your child likes to eat the same food everyday if it’s a nutritious food. Just keep offering a variety of foods. If you’re out and about and need a snack there are many “star picks” to grab at convenience stores or from vending machines. Look for honey graham crackers, fig newtons, animal crackers, ginger snaps, 100% juice, baked (not fried) chips, pretzels, nut and seed mixes, raisins, yogurt, cottage cheese and string cheese. It’s fun to eat on the go and the kids can eat healthy too.